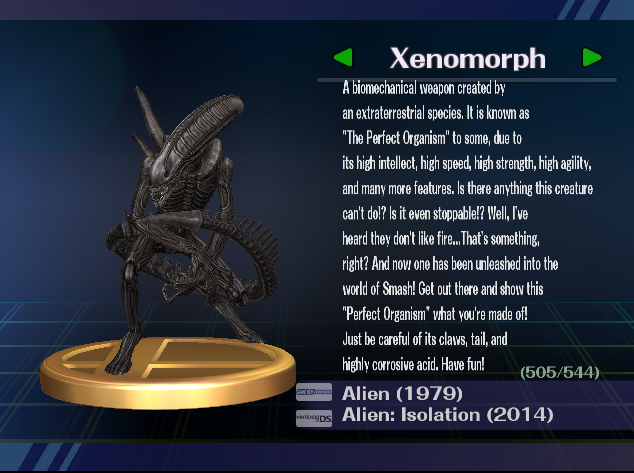 I've seen very little interest in trophy modding when it's just as easy as editing a character. -Any BrawlBox version that imports .dae models. I would recommend v0.71 or any later version. -Any photo editing program. I would recommend either Photoshop or Gimp. -Basic knowledge of model importing, model exporting, model rigging, applying shaders, texture editing, and BrawlBox usage. Disclaimer: You should at least have the trophy you plan on replacing already unlocked. If not, then go do so before doing this tutorial. Disclaimer 2: Take note of file sizes. While file sizes for trophies appear to be rather high when compared to the original files, I would still be alert just in case your file is too big. Disclaimer 3: If your character model has multiple parts (i.e. Multiple faces, Final Smash eyes, etc), delete the unneeded objects before exporting the T-Posed model. Disclaimer 4: You can only replace trophy stuff at the moment. Disclaimer 5: If you can't get this tutorial working, don't fret. I intend on updating this thread, based on questions and feedback. Step 1: Posing the model. This is just like if you were making a CSP pose. Pose the model in a new animation in any way you like. But before you pose, export your model as .dae. Basic pose example is basic. After you make your pose, copy the pose and paste it over the T-Pose then export that as a .dae. You should have two .dae models exported from BrawlBox. Unposed and posed. Step 1a: Exporting your default trophy model. This step is just as easy as step 1. Just export the model as .dae. But before you export, look at the way the rig is set up. This is how you'll be rigging your custom trophy later. Step 2: Image editing to get things out of the way before model editing. Take a BrawlBox screencap without the floor, without bone viewing, and with transparent background. Crop your screenshot in an image editing program. For basics, after cropping, reduce the size of your image to a similar size of one of the textures in the Figure.brres or figdisp.pac. Unlike character textures, these textures don't need to be a multiple of 64.
figdisp.pac image: You only need to save your image after resizing it. But the difficult thing is finding which texture to replace. 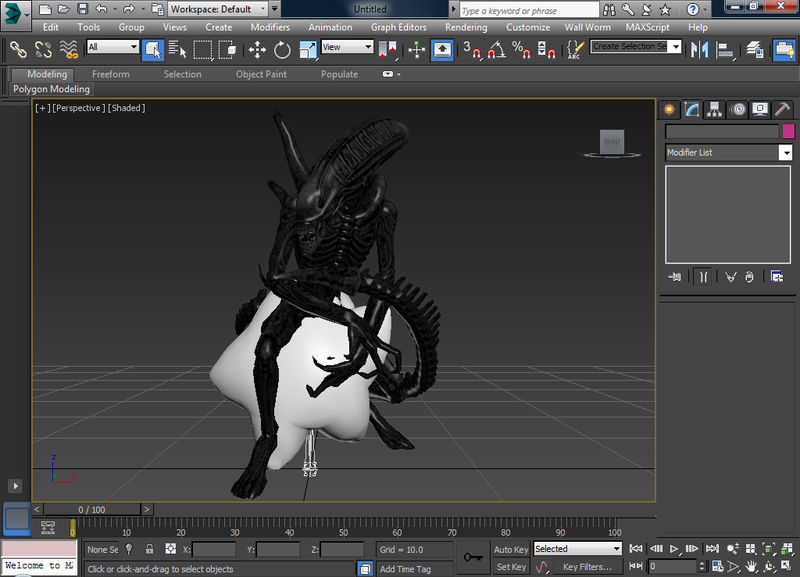 Step 3: Importing and editing in 3DS Max. Import your posed .dae into 3DS Max and make sure you set it to preserve the rig. Take note that the model will look abnormal (this is normal. Do not panic.). Once imported, delete the model, but keep the bones. 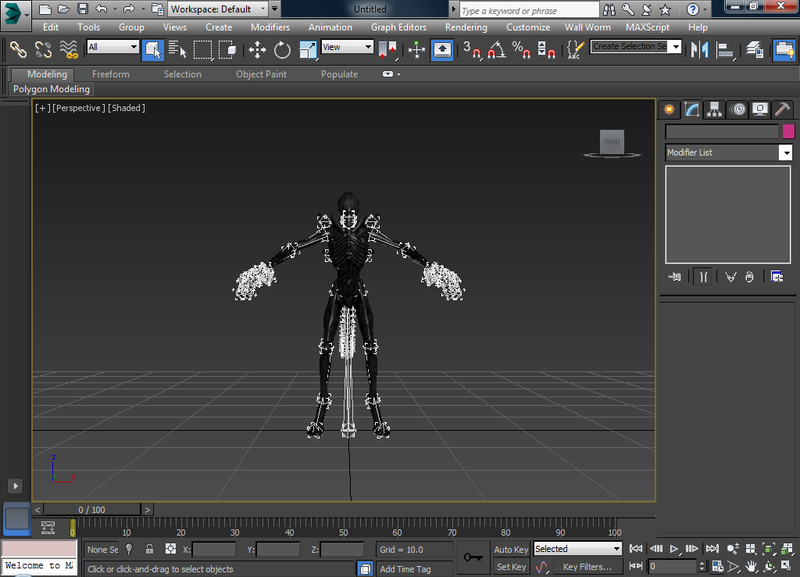 Export the bones as .fbx. Delete the bones and import the unposed .dae into 3DS Max and keep the rig preserved. Once the model is imported, import the .fbx. 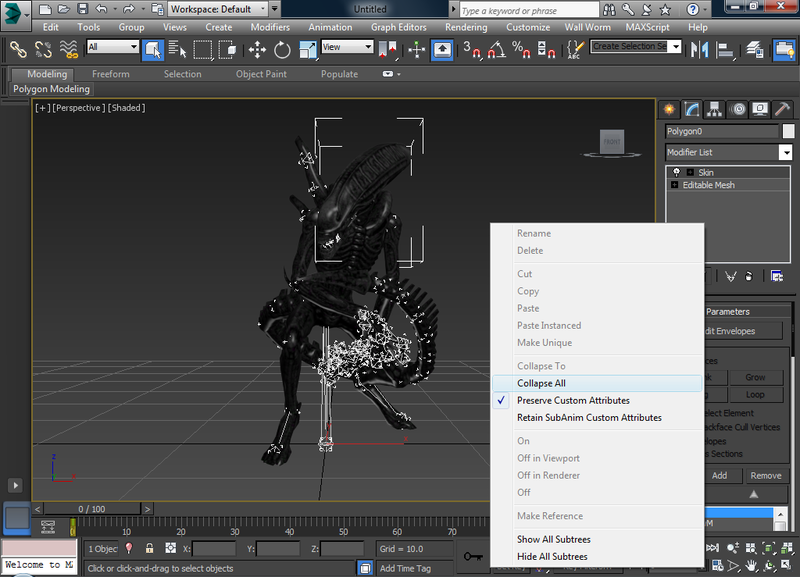 Once you get that done right click on the modifier windows for each model part and click Collapse All. After you collapse all the modifiers on the model, delete the bones. You should be left with a posed model with no bones. 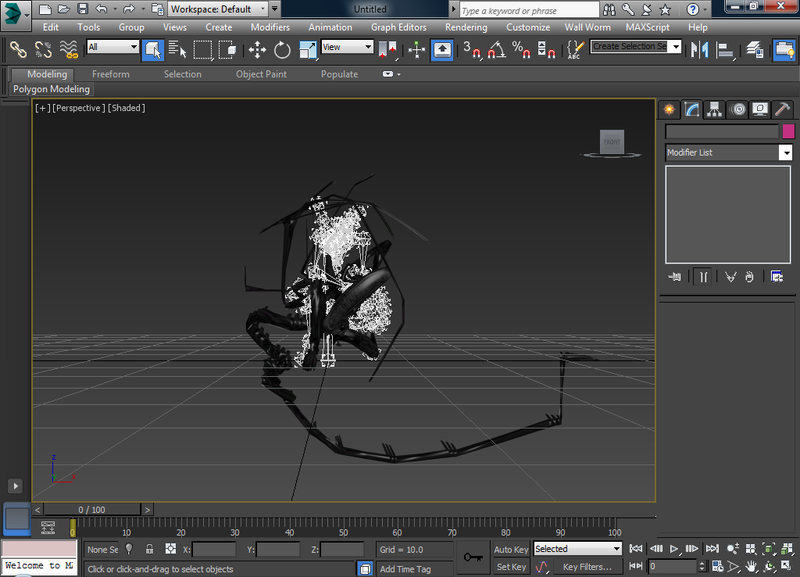 Step 3 Alternative: You can just import the model and delete the bones before collapsing the modifier stacks. 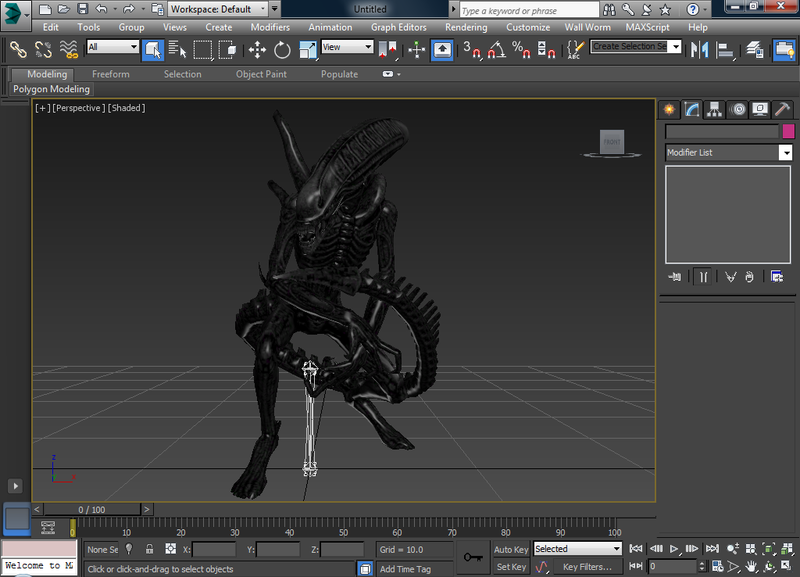 Step 3a: Importing the trophy .dae and rigging. Just import the dae as normal. But it's optional if you want to preserve the rig or not, as you're just going to be deleting the original model anyway. Delete the original trophy model. You should be left with your custom posed model and the trophy's bones. Now this step is optional, but feel free to edit the rotN bone's position to fit the model's hip area. Make sre to set the pos00 and transN bones position to 0 after making any edits to the rotN bone. Now that you have the trophy bones imported, you must now rig. I will not cover basic rigging if you do not know how to do so. There are various basic tutorials on how to get started with rigging. For those who do have at least basic knowledge of rigging, make your model's rig as close to the original trophy's rig as possible. Once you're done rigging, export your model as .dae. Step 3b: Importing into BrawlBox, applying textures, and applying shaders/materials. Import your textures and delete the original textures afterward. After that, delete the original model and import your model as you were importing a character. Once your model is imported, you can fiddle around with shaders (that is if you know how to edit shaders and stuff). But before you do, it would be best to export the shaders and materials from the original trophy. But just like a character, trophies can have fancy things like reflective objects, shiny objects, transparency, glowing, etc. If you want any of those features, find a trophy with the stuff you want, then export the respective shaders and materials. Replace your current shaders and materials and edit accordingly to use your model's textures. Just like rigging, I will not go further into this, as there are also basic tutorials on how to apply shaders and the like. Save after you're satisfied with your edits. Step 4: Applying trophy names and descriptions. Open your ty_fig_ext_list.msbin and ty_fig_name_list.msbin files. This step is more tedious than difficult, due to having to look through all of the trophy names and the like. But once you do, apply your wanted text edits and save. Note: for the ty_fig_ext_list.msbin descriptions, do not have everything on one line. Separate your descriptions into multiple lines. Make it as similar to a standard Brawl trophy as possible. This is among the more easier tests. 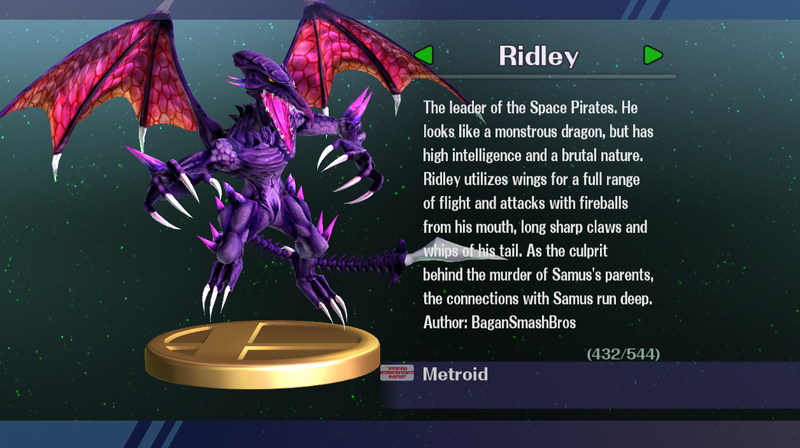 Put your edited files into their respective sections of the SD Card, boot up Dolphin Emulator or your Wii, and find your trophy. If everything works, you should get a result similar to this. Step 5a: Model resizing if it's too big. Sometimes, your model might be too big to fit onto the trophy stand (This image will also show an example of poor text placement). I hope this tutorial helps those whom are interested in having their own custom trophies. i was going to make a tutorial also. guess i dont have to. but cant you delete the bones once the model looks messed up? i do that and it makes the model return to the custom pose. Not all people have the luxury of being able to buy things whenever they want. Some people are barely scraping by in the economy. Modding has made you guys so spoiled. I haven't tried that. I'll edit this post with results. Edit: It worked. I'll update the OP with this info. Necroposting? Nope, its a useful information. 1. Get your model working in Brawl as anything, from an item to a character model. Use other tutorials for that. 2. 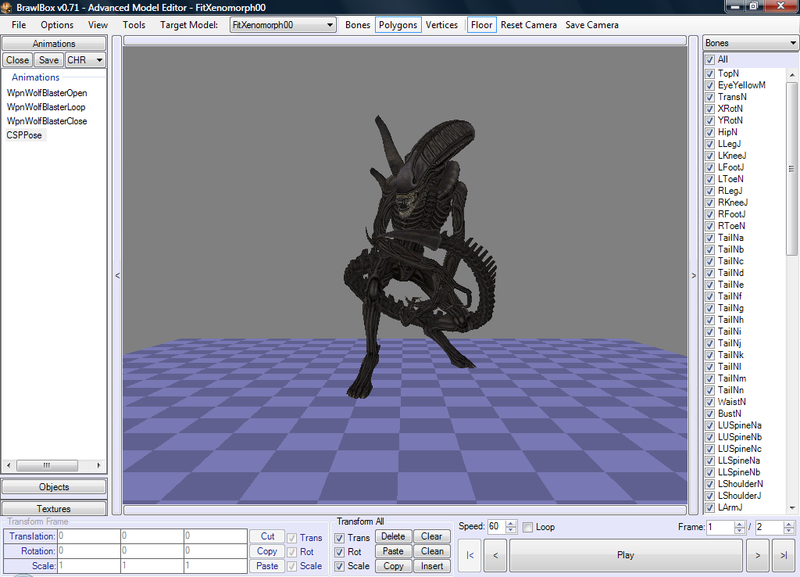 Import model and textures from it into a .brres file using BrawlBox. Then rename model's original TransN bone to Dol*Trophy's Name*TopN. 4. Pose it as you want and rescale it to fit other trophies' size (do not use topN, transN, rotN or Dol*Trophy's Name*TopN for that to avoid any issues). 5. Open model in BrawlBox 0.67. 6. In each bone past Dol*Trophy's Name*TopN, replace currently existing bone flags with "ScaleEqual, Visible, HasGeometry". Note: make sure file size doesn't reaches its limit. That's an inefficient way to do it in my opinion. That would likely bloat the file size, leaving little room for things like details. But if it works, then it works. My tutorial was just how to have more authentic trophies with as little glitches as possible. A model with multiple things rigged to multiple bones is higher in file size than a model all rigged to a few bones. 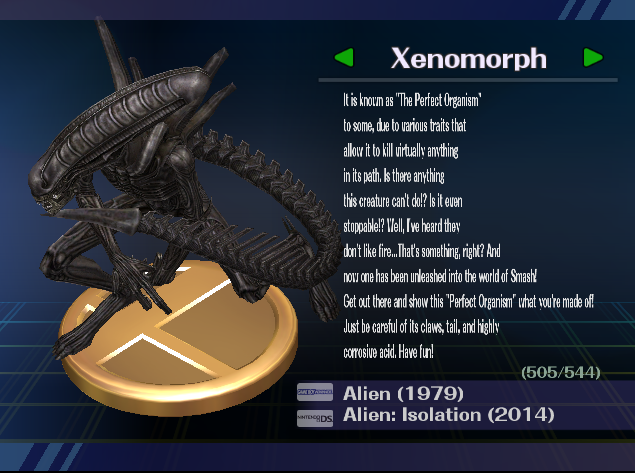 For example: With all the shader stuff added, my custom Xenomorph trophy is 905 KB while my fully rigged Xenomorph with shaders added is over a MB. Well, of course. Thats just the easiest way and is useful for simple models. You won't get far with it using, say, Other M models, but things like Kirby's Return to Dreamland models will work. How do I save the model with the animation? Either you're misunderstanding something, or you're posting in the wrong thread. Well, since "Tutorial threads are exempt from the Necroposting rules", i guess i can ask a question. I followed all the steps in Ridleys tutorial, and it worked! but, the trophy does not rotate with the base, and just stays in one position even when the trophy base is moved, How do i fix this? I'd just recommend you to follow the main tutorial, as with Bagan's method, while it does work, is rather inefficient in the scheme of things. Not to mention, I haven't even tested his method as much as I tested mine, so I wouldn't be surprised if the full skeleton is what's causing the glitch with your custom trophy. Update: I fixed that problem, but now the trophy and the base are higher up than they should be. i would try the main tutorial but i do not have 3ds max. If it's higher up than it should be, then try manually moving the RotN bone down a little bit. For obtaining 3DS Max, you can get the student version for free for 3 years. Page created in 1.07 seconds with 24 queries.